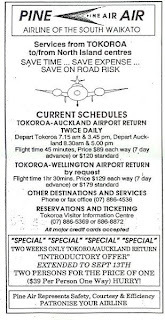 Auckland-Tokoroa Air Services’ flights to Tokoroa ended sometime after mid-1991. 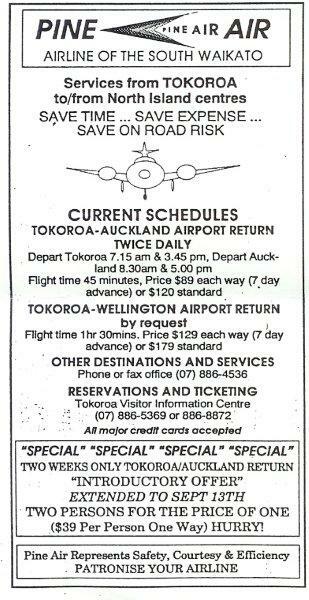 It was some two years later, on the 1st of June 1993, that the South Waikato News announced a new airline was to take off in Tokoroa. Pine Air Ltd was owned by Jim and Libby Lyver. The company proposed to fly a three-day week twice daily return air service to Auckland using Piper Pa23-250 Aztec E, ZK-DGS, with Phil Haslemore appointed as the chief pilot. Services began on the 26th of July 1993 with two return weekday flights to Auckland offered provided there were two or more passengers as well as providing “on demand” services to Wellington and intermediate destinations such as Whangarei, Palmerston North, Taupo, New Plymouth, the Coromandel and Tauranga. In mid-August the South Waikato Expansion Trust entered into a joint venture with Pine Air giving the Trust exclusive booking rights for the airline in return for sales, marketing and business strategies from the Trust. The Trust saw seven potential market segments; the general public, public and community service personnel, central and local government personnel, tourists, charter travel and freight. The airline had a number of plans including a larger 10 seat Piper Chieftain, a base hangar, a pick up and let down service, runway lights for night time operating and the provision of an on call accident and emergency service from the South Waikato to specialist units of hospitals in major centres. ZK-DGS all wrapped at Tokoroa, but not going far on the 6th of September 1993... sadly the photo was quite prophetic, the serive only lasting just over 3 months. Jetstar to do training at Matamata??? Buckley Air and their air service to Tokoroa? Dargaville - Looking for an Air Service?